Talking to children teaches them the richness of language and helps them learn new words and information. Talk to children in the language you are most fluent in. 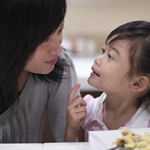 Children learn to understand and use language by listening to conversations around them. Children learn to express themselves and learn how to have a conversation through talking. Talking to children helps stimulate the brain and encourages curiosity. Children learn new words and what they mean by listening to spoken language. Narrate your day. Talk about what you are seeing and doing and don’t simplify your speech. Encourage your baby’s coos, growls and gurgles. Take your baby on a texture walk. Touch different items and describe what they feel like. 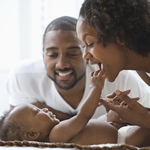 Put your baby’s hand on your mouth and make different sounds. Talk to your child. Listen, ask questions and give your child lots of time to respond. Take a walk outdoors. Point out trees, flowers and birds. While at the grocery store, find foods that begin with certain letters. Use new, longer and more difficult words to build your child’s vocabulary. "Read" picture books with no or few words with your child. Ask your child to help tell the story. Repeat what your child says, but add new words to expand their vocabulary. Set the dinner table together. Talk about what you will have for dinner. Check out these websites for great resources for the literacy practice of talking. The following websites are great resources for the literacy practice of talking. Listen to Sid's dad and then follow along. Rhyme words with Frog's Rhyming Machine. Help Woofster take care of the puppies at Puppy Day Care. Colorado Public Libraries' librarians share some fun rhymes. Several are in Spanish. Help the pups dig for bones. An interactive adventure with Becky Botsford. Can you help Noah and Coco creaete a play? Learn a little spanish also.